This collapsing socialist state is suffering one of the most dramatic outflows of human talent in modern history, with Aquiles Nazoa offering a glimpse into what happens when a nation begins to empty out. Vast gaps in Venezuela’s labor market are causing a breakdown in daily life, and robbing this nation of its future. The exodus is broad and deep — an outflow of doctors, engineers, oil workers, bus drivers and electricians. … Think of Venezuela like one big factory where the societal assembly line no longer works — partly because there are fewer and fewer people to run it. During the first five months of the year, roughly 400,000 Venezuelans have fled the country, following 1.8 million who left over the last two years, according to the Central University of Venezuela. Yet even those numbers may not fully capture the scope of the exodus. Aid workers dealing with the crisis in bordering nations say an average of 4,600 Venezuelans a day have been leaving since Jan. 1 — putting the outflow during this year alone at nearly 700,000. The Venezuelans are running from a nation broken by failed socialist policies, mismanagement, corruption and lower global oil prices — the country’s principal source of cash. What other countries does Bernie Sanders admire, besides Venezuela? What about Nicaragua? Well then, what about Cuba? Surely Cuba is the workers’ paradise of equality and contentment that Bernie Sanders offers to his followers. Bound by a socialist straitjacket, Cuba produces little else that other countries or its own people want to buy. Farming, for example, is constrained by the absence of markets for land, machinery and other inputs, by government-set prices, which are often below the market price, and by bad transport. Cuba imports 80% of its food. Paying for it is becoming harder. In July the economy minister, Ricardo Cabrisas, told the national assembly that the financial squeeze would reduce imports by $1.5bn in 2017. __ https://www.economist.com/the-americas/2017/09/30/clueless-on-cubas-economy? According to Sanders, we should be seeing oppressed Americans fleeing a brutal Trump administration to live in the socialist paradises of Venezuela, Nicaragua, and Cuba. But I have seen no sign of such a pattern of migration. What gives, Bernie? People are certainly migrating. Not only poor people, but rich people as well. 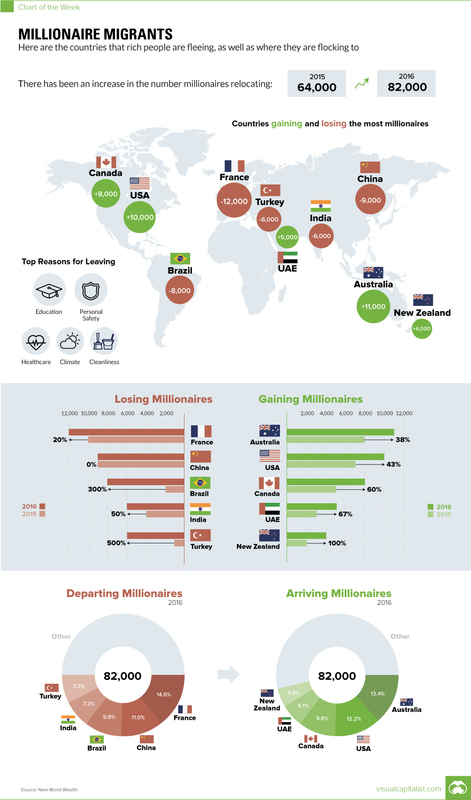 Where are the rich people migrating to, and from? Most people who had the cash to get out of Bernie’s paradises have long since left. The only rich people left are those who run the governments — or who are closely related to their socialist rulers in some way. The daughter of Hugo Chavez is said to have inherited roughly $4 billion from her father — I wonder where he got it? Meanwhile, back in the USA people must struggle with a capitalist economy that — under Trump — seems to be providing too many jobs. Very sad, people seem to be going back to work voluntarily, a brainwashed proletariat that would prefer to work and get paid than sit at home and dream of foods that are no longer available. The uniform poverty of socialism is given lip service by many leftist intellectuals in rich countries. The “equality of deprivation” is seen by the left as nobler somehow, than the inequality under an opportunity culture that runs on capitalism. But they do not move themselves and their families to such places as these. Living under conditions of chronic shortages is somewhat different than heaping euphemistic praise upon these socialist paradises. This entry was posted in Demographics, Government, Idiocracy, Migrations, Venezuela, Wealth of Nations. Bookmark the permalink.